I’m very leery of corporate tax reform, largely because I don’t think there are enough genuine loopholes on the business side of the tax code to finance a meaningful reduction in the corporate tax rate. That leads me to worry that politicians might try to “pay for” lower rates by forcing companies to overstate their income. Based on a new study about so-called corporate tax expenditures from the Government Accountability Office, my concerns are quite warranted. The vast majority of the $181 billion in annual “tax expenditures” listed by the GAO are not loopholes. Instead, they are provisions designed to mitigate mistakes in the tax code that force firms to exaggerate their income. In 2011, the Department of the Treasury estimated 80 tax expenditures resulted in the government forgoing corporate tax revenue totaling more than $181 billion. …approximately the same size as the amount of corporate income tax revenue the federal government collected that year. 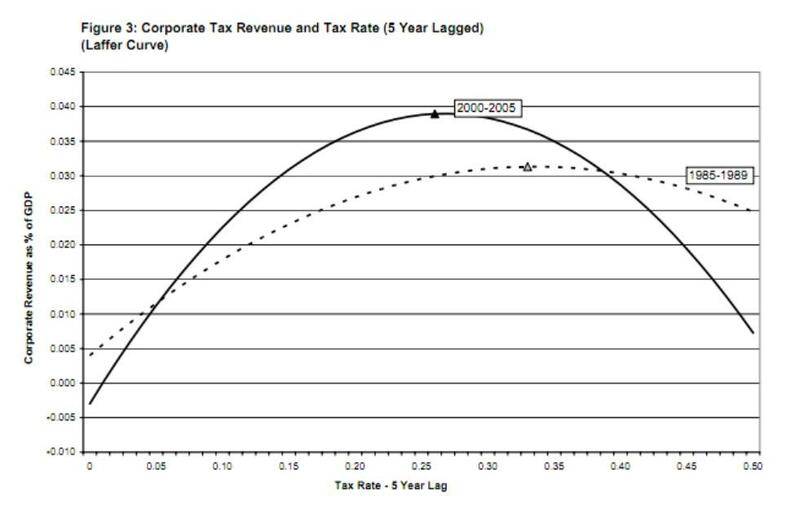 …According to Treasury’s 2011 estimates, 80 tax expenditures had corporate revenue losses. Of those, two expenditures accounted for 65 percent of all estimated corporate revenues losses in 2011 while another five tax expenditures—each with at least $5 billion or more in estimated revenue loss for 2011—accounted for an additional 21 percent of corporate revenue loss estimates. To be blunt, there’s a huge problem in the GAO analysis. Neither depreciation nor deferral are loopholes. I’ve been very critical of the Organization for Economic Cooperation and Development. Most recently, I criticized the Paris-based bureaucracy for making the rather remarkable assertion that a value-added tax would boost growth and employment. The OECD, in an effort to promote redistributionism, has concocted absurdly misleading statistics claiming that there is more poverty in the US than in Greece, Hungary, Portugal, or Turkey. Now the bureaucrats have concocted another scheme to increase the size and scape of government. The OECD just published a study on “Addressing Base Erosion and Profit Shifting” that seemingly is designed to lay the groundwork for a radical rewrite of business taxation. In a new Tax & Budget Bulletin for Cato, I outline some of my concerns with this new “BEPS” initiative. …the BEPS report…calls for dramatic changes in corporate tax policy based on the presumption that governments are not seizing enough revenue from multinational companies. The OECD essentially argues that it is illegitimate for businesses to shift economic activity to jurisdictions that have more favorable tax laws. …The core accusation in the OECD report is that firms systematically—but legally—reduce their tax burdens by taking advantage of differences in national tax policies. Ironically, the OECD admits in the report that revenues have been trending upwards. …the report acknowledges that “… revenues from corporate income taxes as a share of gross domestic product have increased over time. …Other than offering anecdotes, the OECD provides no evidence that a revenue problem exists. In this sense, the BEPS report is very similar to the OECD’s 1998 “Harmful Tax Competition” report, which asserted that so-called tax havens were causing damage but did not offer any hard evidence of any actual damage. To elaborate, the BEPS scheme should be considered Part II of the OECD’s anti-tax competition project. Part I was the attack on so-called tax havens, which began back in the mid- to late-1990s. In a violation of the 8th Amendment’s prohibition against cruel and unusual punishment, my brutal overseers at the Cato Institute required me to watch last night’s debate (you can see what Cato scholars said by clicking here). But I will admit that it was good to see Obama finally put on the defensive, something that almost never happens since the press protects him (with one key exception, as shown in this cartoon). This doesn’t mean I like Romney, who would probably be another Bush if he got to the White House. On the specifics, I obviously didn’t like Obama’s predictable push for class warfare tax policy, but I’ve addressed that issue often enough that I don’t have anything new to add. Let’s start by reiterating what I wrote last year about how to define corporate income: At the risk of stating the obvious, profit is total revenues minus total costs. Unfortunately, that’s not how the corporate tax system works. Sometimes the government allows a company to have special tax breaks that reduce tax liabilities (such as the ethanol credit) and sometimes the government makes a company overstate its profits by not allowing it to fully deduct costs. During the debate, Obama was endorsing policies that would prevent companies from doing the latter. The irreplaceable Tim Carney explains in today’s Washington Examiner. Let’s start with what he wrote about oil companies. I thought Romney’s response about corrupt Solyndra-type preferences was quite strong. Here’s what Tim wrote about corporate jets. …there’s no big giveaway to corporate jets. Instead, some jets are depreciated over five years and others are depreciated over seven years. I explained it last year. When it comes to actual corporate welfare for corporate jets, the Obama administration wants to ramp it up — his Export-Import Bank chief has explicitly stated he wants to subsidize more corporate-jet sales. By the way, depreciation is a penalty against companies, not a preference, since it means they can’t fully deduct costs in the year they are incurred. On another matter, kudos to Tim for mentioning corrupt Export-Import Bank subsidies. Too bad Romney, like Obama, isn’t on the right side of that issue. Obama rolled out the canard about tax breaks for “companies that ship jobs overseas.” Romney was right to fire back that this tax break doesn’t exist. Instead, all ordinary business expenses are deductible — that is, you are only taxed on profits, which are revenues minus expenses. Tim’s actually too generous in his analysis of this issue, which deals with Obama’s proposal to end “deferral.” I explain in this post how the President’s policy would undermine the ability of American companies to earn market share when competing abroad - and how this would harm American exports and reduce American jobs. To close on a broader point, I’ve written before about the principles of tax reform and explained that it’s important to have a low tax rate. But I’ve also noted that it’s equally important to have a non-distortionary tax code so that taxpayers aren’t lured into making economically inefficient choices solely for tax reasons. That’s why there shouldn’t be double taxation of income that is saved and invested, and it’s also why there shouldn’t be loopholes that favor some forms of economic activity. Too bad the folks in government have such a hard time even measuring what’s a loophole and what isn’t. Mitt Romney is being criticized for supporting “territorial taxation,” which is the common-sense notion that each nation gets to control the taxation of economic activity inside its borders. While promoting his own class-warfare agenda, President Obama recently condemned Romney’s approach. His views, unsurprisingly, were echoed in a New York Times editorial. President Obama raised … his proposals for tax credits for manufacturers in the United States to encourage the creation of new jobs. He said this was greatly preferable to Mitt Romney’s support for a so-called territorial tax system, in which the overseas profits of American corporations would escape United States taxation altogether. It’s not surprising that large multinational corporations strongly support a territorial tax system, which, they say, would make them more competitive with foreign rivals. What they don’t say, and what Mr. Obama stressed, is that eliminating federal taxes on foreign profits would create a powerful incentive for companies to shift even more jobs and investment overseas—the opposite of what the economy needs. Since even left-leaning economists generally agree that tax credits for manufacturers are ineffective gimmicks proposed for political purposes, let’s set that topic aside and focus on the issue of territorial taxation. Worldwide taxation means that a company is taxed not only on its domestic earnings, but also on its foreign earnings. Yet the “foreign-source income” of U.S. companies is “domestic-source income” in the nations where those earnings are generated, so that income already is subject to tax by those other governments. In other words, worldwide taxation results in a version of double taxation. The U.S. system seeks to mitigate this bad effect by allowing American-based companies a “credit” for some of the taxes they pay to foreign governments, but that system is very incomplete. And even if it worked perfectly, America’s high corporate tax rate still puts U.S. companies in a very disadvantageous position. If an American firm, Dutch firm, and Irish firm are competing for business in Ireland, the latter two only pay the 12.5 percent Irish corporate tax on any profits they earn. The U.S. company also pays that tax, but then also pays an additional 22.5 percent to the IRS (the 35 percent U.S. tax rate minus a credit for the 12.5 percent Irish tax). In an attempt to deal with this self-imposed disadvantage, the U.S. tax system also has something called “deferral,” which allows American companies to delay the extra tax (though the Obama administration has proposed to eliminate that provision). Romney proposes to put American companies on a level playing field by going in the other direction. Instead of immediate worldwide taxation, as Obama wants, Romney wants to implement territorial taxation. But what about the accusation from the New York Times that territorial taxation “would create a powerful incentive for companies to shift even more jobs and investment overseas”? If a company can save money by building widgets in Ireland and selling them to the US market, then we shouldn’t be surprised that some of them will consider that option. So does this mean the President’s proposal might save some American jobs? Definitely not. If deferral is curtailed, that may prevent an American company from taking advantage of a profitable opportunity to build a factory in some place like Ireland. But U.S. tax law does not constrain foreign companies operating in foreign countries. So there would be nothing to prevent a Dutch company from taking advantage of that profitable Irish opportunity. And since a foreign-based company can ship goods into the U.S. market under the same rules as a U.S. company’s foreign subsidiary, worldwide taxation does not insulate America from overseas competition. It simply means that foreign companies get the business and earn the profits. To put it bluntly, America’s tax code is driving jobs and investment to other nations. America’s high corporate tax rate is a huge self-inflected wound for American competitiveness. Getting rid of deferral doesn’t solve any problems, as I explain in this video. Indeed, Obama’s policy would make a bad system even worse. But, it’s also important to admit that shifting to territorial taxation isn’t a complete solution. Yes, it will help American-based companies compete for market share abroad by creating a level playing field. But if policymakers want to make the United States a more attractive location for jobs and investment, then a big cut in the corporate tax rate should be the next step. American companies are hindered by what is arguably the world’s most punitive corporate tax system. The federal corporate rate is 35 percent, which climbs to more than 39 percent when you add state corporate taxes. Among developed nations, only Japan is in the same ballpark, and that country is hardly a role model of economic dynamism. But the tax rate is just one piece of the puzzle. It’s also critically important to look at the government’s definition of taxable income. If there are lots of corrupt loopholes – such as ethanol – that enable some income to escape taxation, then the “effective” tax rate might be rather modest. On the other hand, if the government forces companies to overstate their income with policies such as worldwide taxation and depreciation, then the statutory tax rate understates the actual tax burden. The U.S. tax system, as the chart suggests, is riddled with both types of provisions. This information is important because there are good and not-so-good ways of lowering tax rates as part of corporate tax reform. If politicians decide to “pay for” lower rates by eliminating loopholes, that creates a win-win situation for the economy since the penalty on productive behavior is reduced and a tax preference that distorts economic choices is removed. But if politicians “pay for” the lower rates by expanding the second layer of tax on U.S. companies competing in foreign markets or by changing depreciation rules to make firms pretend that investment expenditures are actually net income, then the reform is nothing but a re-shuffling of the deck chairs on the Titanic. Now let’s look at President Obama’s plan for corporate tax reform. The good news is that he reduces the tax rate on companies from 35 percent to 28 percent (still more than 32 percent when state corporate taxes are added to the mix). The bad news is that he exacerbates the tax burden on new investment and increases the second layer of taxation imposed on American companies competing for market share overseas. In other words, to paraphrase the Bible, the President giveth and the President taketh away. This doesn’t mean the proposal would be a step in the wrong direction. There are some loopholes, properly understood, that are scaled back. But when you add up all the pieces, it is largely a kiss-your-sister package. Some companies would come out ahead and others would lose. Unfortunately, that’s not enough to measurably improve incomes for American workers. In a competitive global economy, where even Europe’s welfare states recognize reality and have lowered their corporate tax rates, on average, to 23 percent, the President’s proposal at best is a tiny step in the right direction.